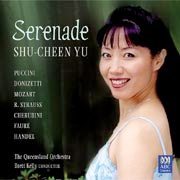 A stunning collection of opera arias and sacred songs from the divine Shu-Cheen Yu. The runaway success of Shu-Cheen’s previous albums Lotus Moon and Willow Spirit Song have established her as one of opera’s brightest stars. This album includes classics like Mozart’s Exultate Jubilate, Rachmaninov’s Vocalise, and the Pie Jesu from Faure’s Requiem as well as songs and arias by Puccini, Donizetti, Bach, Handel and many more.